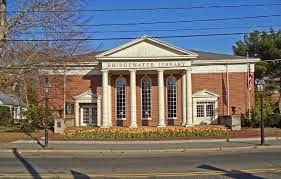 The Friends of the Bridgewater Public Library are conducting their annual membership drive for fiscal year 2015, which runs from July 1, 2014 through June 30, 2015. The Friends of the Library is an independently incorporated organization whose purpose is to enhance library services. During the past year, the Friends have been instrumental in providing money for books, library supplies, and other materials. They funded programs for adults and children, including “The Declaration of Independence” presented by Prof. Gary Hylander, “Singing Bowls” presented by Stephanie Woods, “Downsizing” presented by Henry Callan, “Rescue of the Bounty” presented by Michael Tougias, “Cooking with Miss Debbie”, and “Gingerbread Houses”. The Friends also paid for craft supplies for the Summer Reading Program, storytimes and other in-house events. They are contributing to the purchase of eight new computers for the public which will offer access to the internet and Microsoft Office software. Several museum passes, including the Boston Museum of Science, the New Bedford Whaling Museum, the Isabella Stewart Gardner Museum, and the New England Aquarium, were also funded by the Friends. The library is fortunate to have a solid group of board members who worked tirelessly to raise funds for the library. Events such as our miniature-golf tournament, sales of library-themed tote bags and fair-trade coffee, book sales and our Empties for Cash collections provide income for the Friends. However, membership dues are a major source of income. Basic dues are $20 and senior citizens age 65+ may join for only $10. Other categories are available. Membership applications are available at the Bridgewater Public Library, located at 15 South Street, and on the Friend’s of the Library website at bridgewaterFOL.org/Membership.